are designed for the extraction of DNA from agarose gels and for the purification of PCR products. DNA fragments purified with FastGene® Gel/PCR Extraction Kits are ready for direct use in all common downstream applications, like sequencing, ligation and transformation, restriction digestion, microarray analysis, PCR and in vitro transcription. Fig. 1: PCR fragments of 300 bp were purified from 40 µl of a PCR stock solution using FastGene® Gel/PCR Extraction Kit and a competitor kit, according to manufacturers protocol. DNA was eluted in 20 µl elution buffer and 5 µl of eluate was analyzed on a 1,5% TAE agarose gel. The figure demonstrates that the FastGene® Gel/PCR Extraction Kit shows up to 90% of DNA recovery. Fig. 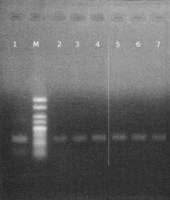 2: 10 µl of a PCR stock solution with a 100 bp amplicon were applied on a TBE agarose gel. After electrophoresis the DNA was purified using a competitor kit and the FastGene® Gel/PCR Extraction Kit, according to manufacturers protocol. DNA was eluted in 20 µl elution buffer and 10 µl of eluate was analyzed on a 2% TAE agarose gel.